Not to be confused with Final Fantasy X-2. Final Fantasy XII[a] is a fantasy role-playing video game developed and published by Square Enix for the PlayStation 2 home video console. A part of the Final Fantasy series, the game was released in 2006. It introduced several innovations to the series: an open world, a seamless battle system, a controllable camera, a customizable "gambit" system, which lets the player control the artificial intelligence (AI) of characters in battle, a "license" system, which determines what abilities and equipment can be used by characters, and a hunting side quest, which allows the player to find and defeat increasingly difficult monsters in the game's open world. Final Fantasy XII also includes elements from previous games in the series, such as Chocobos and Moogles. The game takes place in the fictional land of Ivalice, where the empires of Archadia and Rozarria are waging an endless war. Dalmasca, a small kingdom, is caught between the warring nations. When Dalmasca is annexed by Archadia, its princess, Ashe, creates a resistance movement. During the struggle, she meets Vaan, a young adventurer who dreams of becoming a sky pirate in command of an airship. They are quickly joined by a band of allies; together, they rally against the tyranny of the Archadian Empire. Final Fantasy XII received critical acclaim, earning numerous Game of the Year awards. As of November 2009, the game sold over six million copies worldwide on PlayStation 2. A sequel, Final Fantasy XII: Revenant Wings, was released for the Nintendo DS in 2007. A high-definition remaster of the International Zodiac Job System version, subtitled The Zodiac Age, was released for the PlayStation 4, Microsoft Windows, Nintendo Switch, and Xbox One. Throughout the game, the player directly controls the on-screen character from a third-person perspective to interact with people, objects, and enemies. Unlike previous games in the series, the player can also control the camera with the right analog stick, allowing for a 360° view of the surroundings. While in towns and cities, the player may only see from the perspective of Vaan, but any character may be controlled in the field. The world of Final Fantasy XII is rendered to scale relative to the characters in it; instead of a caricature of the character roaming around miniature terrain, as found in the earlier Final Fantasy games, every area is represented proportionally. The player navigates the overworld on foot, Chocobo, or by airship. 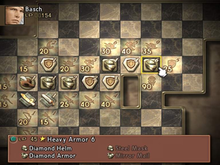 Players may save their game to a memory card using save crystals or gate crystals, and may use the latter to teleport between gate crystals. An in-game bestiary provides incidental information about the world of Final Fantasy XII. Final Fantasy XII restructures the system of earning gil, the currency of the Final Fantasy games; instead of gil, most enemies drop "loot" which can be sold at shops. This ties into a new battle mechanic which rewards the player with improved loot for slaying a particular type of enemy multiple times in a row. Selling different types of loot also unlocks a bazaar option in shops, which provides items at a lower cost, or items exclusive to the bazaar. In Active Dimension Battle (ADB), characters move freely and attack as soon as they are ready. Blue lines depict the player's targets and red lines depict those of the enemies. Excluding the massively multiplayer online role-playing game Final Fantasy XI, Final Fantasy XII is the first entry in the main Final Fantasy series not to include random encounters. Instead, enemies are visible in the overworld and the player may choose to fight or avoid them. Battles unfold in real time using the "Active Dimension Battle" (ADB) system. Battles begin when the party comes within range of an aggressive enemy, the party attacks an enemy, or a story event initiates a confrontation. When a character or enemy begins an action, target lines connect characters to other party members or enemies; different colors represent the different types of action. The player may swap to and issue commands to any of the three characters in the party, but guest characters are controlled by artificial intelligence (AI). Battle commands are initiated through a series of menus, and include Attack, Magicks, Technicks, Mist, Gambits, and Items. The player may switch any active character with an inactive character at any time, unless the active character is targeted by an attack or ability. Characters who are knocked out may also be substituted. A new feature in Final Fantasy XII is the "gambit" system, which allows the player to program each character to perform certain commands in battle in response to specified conditions. Using gambits, the player may set reactions to different stimuli for each character. Each gambit consists of three parts: a target, an action, and a priority. The target specifies which ally or foe to act on and the condition for applying the action. For example, the target "Ally: HP < 70%" causes the character to target any ally whose hit points have fallen below 70%. The action is the command to be performed on the target. The priority determines which gambit to perform when multiple gambits are triggered. These heuristics guide the characters when acting autonomously, though player-directed commands are always given top priority. In Final Fantasy XII, a mysterious phenomenon known as "Mist" is the key energy which allows characters to cast summoning magic and perform "Quickenings". After defeating an Esper in combat, the player will be able to summon it to the battlefield. 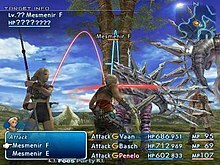 Similar to Final Fantasy X, the summoned creatures become active participants in battle, as opposed to the cinematic attacks seen in previous games in the series. Unlike Final Fantasy X, however, Espers follow hidden gambits, rather than the player's direct command. The summoner remains an active member in the fight, able to attack and cast support magic, instead of leaving the party or standing idle while the summoned creature fights. An Esper will leave the battle if either the summoner or itself is knocked out, its time limit expires, or it executes its special attack. Some Espers have origins in Final Fantasy Tactics and Final Fantasy Tactics Advance and others are derived from the final bosses of previous Final Fantasy games such as Chaos, the final boss of the first Final Fantasy, and Zeromus, the final boss of Final Fantasy IV. The License Board; raised panel icons indicate acquired licenses. As in many role-playing games (RPGs), characters "level up" each time they earn a set number of experience points from defeating enemies; each level gained increases the character's statistics and improves performance in battle. Statistics include hit points, the amount of damage a character can receive; strength, the power of the character's physical attacks; and magic, the potency of the character's magical spells. In addition to leveling up, players may improve their characters via the License Board. The License Board is an array of panels that contain "licenses" which allow a character to perform certain actions. The board is split into two parts; the upper part comprises Magick, Technick, Accessory, and Augment (stat increases and other permanent buffs) licenses, and the bottom part comprises mostly Weapon and Armor licenses. To use a Magick, Technick, or piece of equipment, the character must obtain its corresponding license by spending the required amount of LP (License Points). LP are earned in battle along with the experience points. Like the Sphere Grid in Final Fantasy X, all characters may obtain all licenses on the board; however, each Quickening and Esper license may only be activated by a single character. Final Fantasy XII is set within the land of Ivalice during an age when "magic was commonplace" and "airships plied the skies, crowding out the heavens". At this time, magicite, a magic-rich mineral, is commonly used in magic spells and in powering airships—a popular form of transportation in Ivalice. Ivalice is divided into three continents: Ordalia, Valendia, and Kerwon. Ordalia is located in the western part of Ivalice. The Rozarrian Empire makes its home in the vast inland plains of this continent as the eastern portion of it is largely desert and "jagd"—lawless regions so rich in Mist, the ethereal manifestation of magicite, that airships cannot function. Valendia is the home of Imperial Archadia, where lush highlands dot the landscape. Central to the story is Dalmasca, a small kingdom between the two continents and empires. Located in the middle of the Galtean Peninsula of Ordalia, Dalmasca is surrounded by an expanse of desert. The temperate climate of Dalmasca differs from the cold environs of Kerwon to the south and the lush plains of Valendia and Ordalia. During this time, Ivalice is beset by the pending war between the forces of Rozarria and Archadia. Caught between the two powerful Empires, Dalmasca and a number of smaller nations have already been subjugated by Archadia two years before the game begins. Cast of Final Fantasy XII; the characters were designed by Akihiko Yoshida. The six main playable characters in Final Fantasy XII are Vaan, an energetic orphan of Rabanastre who dreams of becoming a sky pirate; Ashe, a determined princess of Dalmasca who lost her father and her husband in the Archadian invasion; Basch, a disgraced knight of Dalmasca charged with treason for slaying the king; Balthier, a gentlemanly sky pirate who pilots his airship, the Strahl; Fran, Balthier's partner and a Viera exile whose knowledge extends to legends and myths; and Penelo, Vaan's childhood friend who accompanies him on journeys to "keep an eye on him". The Archadian Empire is ruled by House Solidor, headed by Emperor Gramis. The emperor's sons are Vayne and Larsa, the former a military genius and the game's main antagonist, and the latter a charismatic seeker of peace. Judge Magisters, upholders of Archadian law, protect House Solidor and execute every command issued by the ruling family. The technological marvels of airships and synthetic nethicite—a form of magicite that absorbs Mist—are thanks to Doctor Cid, a prominent researcher from Archadia. The Resistance against Archadia includes Dalmascan knight Vossler, an ally of Basch; Marquis Halim Ondore IV, the game's narrator and ruler of the skycity Bhujerba; Reddas, a sky pirate based in the port at Balfonheim; and the Rozarrian Empire, of which Al-Cid Margrace is a prince of the ruling family. The mythos of Final Fantasy XII revolves around a character known as Dynast-King Raithwall, a man who once united Ivalice to create the Galtean Alliance in ages past. In Dalmasca's capital city of Rabanastre, Princess Ashelia (Ashe) of Dalmasca and Prince Rasler of Nabradia have just wed, as the Archadian Empire invades the two countries. Rasler is killed in the war, the city of Nabudis is destroyed in a single explosion, and the Dalmascan King Raminas is assassinated moments after signing a treaty of surrender. Marquis Ondore announces that the assassin was Dalmascan captain Basch, who has been sentenced to death, and that Princess Ashe has committed suicide. Two years later, Vaan, a Rabanastre street urchin, ignores his friend Penelo's objections and infiltrates the palace during a dinner celebrating the appointment of Archadian prince Vayne Solidor as consul. In the treasury he finds a piece of magicite, a powerful magical crystal. He is discovered by Balthier and Fran, a pair of sky pirates looking for the magicite. The three escape as Dalmascan Resistance forces assault the palace, and in the sewers they meet the Resistance leader, Amalia, before being captured by Archadian forces. Detained in the Nalbina dungeons, they meet Basch, who was imprisoned but not killed, and who states his twin brother Gabranth was the one to kill the king. The four then escape together back to Rabanastre. There they discover Penelo has been kidnapped and taken to the floating city of Bhujerba by the bounty hunter Ba'Gamnan, who seeks to draw Balthier to him. In Bhujerba, they meet Lamont, a curious boy who is Vayne's younger brother, Larsa, in disguise. After rescuing Penelo from the Lhusu Mines, Larsa invites her to stay with him. Basch confronts the Marquis over his lies, but the party is captured and detained aboard the Archadian airship Leviathan, headed by Judge Ghis. On the Leviathan, the party is reunited with Penelo and Amalia, who is revealed to be Princess Ashe. Ghis takes the magicite, which is revealed to be a royal Dalmascan artifact, "deifacted nethicite", from Vaan to send to Archadia. The party escapes the airship, but as Ashe had planned to use the magicite as proof that she was the princess, the group makes plans to collect another of the pieces of nethicite, the Dawn Shard. They do so, but are again captured by Ghis; when he tries to use the Dawn Shard in the Leviathan rather than the "manufacted" (artificially made) magicite it normally uses, his entire airship fleet is destroyed in a mirror of the destruction of Nabudis, and the party flees again. The party encounters Larsa, who seeks a peace treaty between Dalmasca and the empire. Convinced, Ashe and the group go to Mt. Bur-Omisace to seek the Gran Kiltias Anastasis, Ivalice's religious leader, and beg his approval of her as queen of Dalmasca. There, they also meet Al-Cid Margrace, a member of the Rozarrian Empire ruling family, who is seeking to avert a war between Rozarria and Archadia and is in talks with Larsa. Their plans are curtailed when Anastasis is killed by Archadia, and soon afterwards the Archadian emperor Gramis dies and Vayne ascends the throne. After retrieving the Sword of Kings, which can destroy nethicite, the party journeys to Archadia to retrieve Larsa, who has been taken. There they discover Doctor Cid, who created manufacted magicite, and who directs them to go to Giruvegan as it is the source of nethicite. In Giruvegan, only Ashe can enter the final area, where she encounters the makers of nethicite, the immortal Occuria, who "pull the strings of history"; they give her the Treaty Blade to cut new pieces of nethicite from the Sun-cryst, the source of all nethicite and its power. She learns that Venat, one of the Occuria, has defected to put the "reins of History back in the hands of Man", controlling Vayne and Cid, manipulating the former's goal to conquer Ivalice and become the new Dynast King, and leading the latter to create manufacted magicite to reduce the relative power of the Occuria. Archadia's expansion campaign was a front to capture the existing shards of nethicite. Ashe and the party journey to Pharos tower, the location of the Sun-cryst, where she decides not to take her revenge by following the Occuria's wishes, but instead destroy the Sun-cryst. The party defeats Gabranth, who reveals that he killed King Raminas, and then the party also defeats Cid, before destroying the crystal. The group later learns from Al-Cid that the Dalmascan Resistance, led by Ondore, is about to fight Archadia in Rabanastre, but the Archadian forces now include the Sky Fortress Bahamut, powered by the Mist released by the destruction of the Sun-Cryst. They infiltrate the Bahamut, and find Larsa attempting to dissuade his brother Vayne from his plans for war to no avail. They defeat Vayne and Venat, and Ashe and Larsa announce the end of the conflict to the battlefield. Larsa becomes the Archadian emperor and Ashe the Queen of Dalmasca; Basch replaces his brother Gabranth as Larsa's protector; Vaan and Penelo fly an airship to meet Balthier and Fran for another adventure. Development for Final Fantasy XII began in December 2000 and was headed by Final Fantasy Tactics director Yasumi Matsuno and Final Fantasy IX director Hiroyuki Ito. Matsuno provided the original concept and plot but was forced to bow out of his roles midway through production due to health concerns. The team was restructured as a consequence: the new directorial duo consisted of Ito and Hiroshi Minagawa, while Akitoshi Kawazu of SaGa series fame became the game's executive producer. Series creator Hironobu Sakaguchi was disappointed by Matsuno's departure and declined to play the game beyond its introduction. The desire to move away from random encounters was present since the beginning of development. This desire fueled the development of the Active Dimension Battle system so players could seamlessly move from battle to exploration. The gambit system was conceived early on as a way to facilitate this change. Battle system designer Hiroshi Tomomatsu said that it gradually moved away from a complex and rigid formula to the more flexible form seen in the final version of the game. Ito drew inspiration for gambits from plays in American football where each team member has a specific job to do based on the conditions and desired outcome. As for the license system, he explained that needing "licenses" to perform certain actions was a natural extension of the rigid structured society of Archadia, as epitomized by its Judges. At the early stages of development, Minagawa revealed that numerous ideas and features were planned for the game, but were dropped from the final stages due to certain constraints and hardware limitations. Some of these included the ability for a second player to join in the gameplay, enabling a two-player mode. Another idea that was given a considerable amount of thought was the ability to recruit non-player characters to join in the mob hunts. Due to the technical limitations of the console and multiple number of characters joining the fray, the development phase took longer than expected, causing delays. Design inspiration came from a mix of medieval Mediterranean countries as demonstrated by the architectural styles found throughout Ivalice along with many of the races populating the region. The art team, led by art directors Hideo Minaba and Isamu Kamikokuryō, visited Turkey, which influenced the game's Mediterranean-style setting. The developers also used styles and deco from other sources including areas in India and New York City. Of note is the use of Sanskrit in the city of Bhujerba. Phrases such as "svagatam" (welcome) and titles like "parijanah" (guide) are lifted directly from Sanskrit. Minaba mentions that the team tried to bring out Arabic culture in the design of the game. War is a prominent theme of the game and the developers stated that the cutscene battles are influenced by Ancient Rome. When asked to comment on the fan observation of Star Wars similarities, Minaba replied that although he was a fan of the series, it was not necessarily an influence to the game's designs. It has also been noted that the similarities originate from The Hidden Fortress, the 1958 Akira Kurosawa film that inspired Star Wars. Basch was initially meant to be the main protagonist of the story, but the focus was eventually shifted to Vaan and Penelo when the two characters were created later in development. The development team explained that their previous game, Vagrant Story, which featured a "strong man in his prime" as the protagonist had been unsuccessful and unpopular; the change regarding Final Fantasy XII from a "big and tough" protagonist to a younger, youthful one was thus decided after targeting demographics were considered. With the casting of actor Kouhei Takeda for the voice acting and motion capture, Vaan became less feminine and more "active, upbeat bright and positive". Comments were made about the similarity between main character designer and background design supervisor Akihiko Yoshida's creations and those of Tetsuya Nomura, another Square Enix character designer. Yoshida feels this connection is sparked by the style of color used by both artists, which involves a color consistency between the characters and the environments. The designers stated that non-human characters and races feature a prominent role in the game, which was influenced by an interest in history among the developers. Miwa Shoda wrote a storyline for the game premised on the basis of the cutscenes and world setting that had already been finished when she joined the team. Scenario writer Daisuke Watanabe in turn fleshed out Shoda's plot into a script. During the English localization process, Alexander O. Smith, who had previously worked on Vagrant Story and Final Fantasy X, acted as producer and translator. While still preserving the meaning behind the Japanese script, Smith made the decision to use different dialects of English to reproduce the regional differences in pronunciation found in the Japanese version. He also tried to distance the game from the "flat reads" found in other dubbed work by casting voice actors who had experience in theatre work. In terms of general changes, the localization team introduced widescreen 16:9 ratio support and reinserted scenes that were left out of the original Japanese version for political reasons and to preserve an "All Ages" CERO rating. On November 15, 2005, a playable demo of the game was shipped with the North American release of Dragon Quest VIII. To commemorate the release of Final Fantasy XII, playable demos of the English version were available at DigitalLife's Gaming Pavilion in New York City on October 11, 2006, a day dubbed "Final Fantasy XII Gamer's Day". Additionally, Square Enix gave fans the chance to cosplay as characters from Final Fantasy XII. Each person was asked to show Square Enix three photos of his or her costume for a chance to win a trip to New York and participate in the Final Fantasy XII Gamer's Day event. 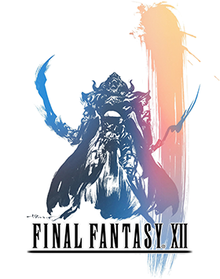 Final Fantasy XII once held the Guinness World Record for longest development period in a video game production, with a total of five years, spanning from 2001 until its release in 2006. At a Final Fantasy XII "postmortem" at MIT in March 2009, Hiroshi Minagawa mentioned that several years of production were devoted to the creation of custom tools used for the development of the game. It was also listed as 8th on the Guinness top 50 games of all time in 2009. 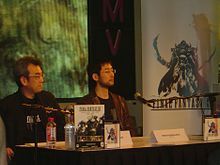 Hitoshi Sakimoto composed and arranged most of the game's soundtrack, with Hayato Matsuo and Masaharu Iwata creating seven and two tracks respectively. Nobuo Uematsu, following his departure from Square Enix in 2004, only contributed the ending song, "Kiss Me Good-Bye". Sakimoto experienced difficulty following in Uematsu's footsteps, but he decided to create a unique soundtrack in his own way. "Kiss Me Good-Bye" was performed in both English and Japanese by Angela Aki. Aki's style of playing the keyboard while singing reminded Uematsu of his childhood idol, Elton John, which was one of the reasons he chose her. The English version of the song was featured in both the Japanese and North American versions of the game. In addition to the theme song, violinist Taro Hakase co-composed, arranged, and performed the game's ending credits theme, Symphonic Poem "Hope", along with Yuji Toriyama. Two promotional soundtracks were released before the original soundtrack, Symphonic Poem "Hope" and The Best of the Final Fantasy XII Soundtrack, on March 1 and 15, 2006, respectively. The former contains all the music used in the game's trailer performed by Taro Hakase, including Symphonic Poem "Hope". The original soundtrack itself was released in Japan on May 31, 2006. It consists of 4 CDs with 100 tracks, and includes promotional tracks not in the final version of the game. The CD single for "Kiss Me Good-Bye" was released on the March 15, 2006. A limited edition was also released, featuring a DVD containing the music video for "Kiss Me Good-Bye". Tofu Records has released an abridged version of the original soundtrack, which contains 31 songs, including "Kiss Me Good-Bye". On March 16, 2006, Sony Computer Entertainment Japan released a special Final Fantasy XII package, which contained a PlayStation 2 game system, the Final Fantasy XII game, a standard DualShock controller, and a vertical console stand. The Japanese third-party manufacturer Hori also released Final Fantasy XII memory cards on the day of the game's release; stickers of Final Fantasy XII characters are included. Game peripheral maker Logicool (Logitech's Japanese branch) released a special edition Final Fantasy XII controller on the same day. 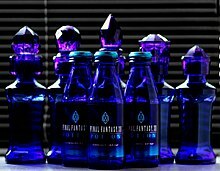 Suntory produced "Final Fantasy XII Potion"—a drink containing such ingredients as royal jelly, chamomile, sage, thyme, and marjoram. The drinks became commercially available in Japan on March 7, 2006. Suntory also released a Final Fantasy XII Premium Box, which came with a Final Fantasy XII collector's card. The Potion was a limited edition product and is no longer available. Final Fantasy XII was also adapted into a manga by Gin Amou. Square Enix published the series in a total of five tankōbon volumes from December 22, 2006 to August 22, 2009. Studio BentStuff published three Ultimania books: Final Fantasy XII Battle Ultimania and the Final Fantasy XII Scenario Ultimania on June 16, 2006, and Final Fantasy XII Ultimania Ω on November 24, 2006. The Battle Ultimania provides a description and analysis of the new battle system and its components, and developer interviews. The Scenario Ultimania describes the main scenarios in the game, profiles on the characters and areas in Ivalice, developer interviews, and details on each location. The last guide, the Ultimania Ω, includes voice actor interviews, the complete story of Final Fantasy XII including additional character profiles, a collection of artworks and illustrations, the complete play guide, and a novella written by Benny Matsuyama, author of Hoshi wo Meguru Otome from the Final Fantasy VII Ultimania Ω Guide. Another Ultimania edition, the Final Fantasy XII International Zodiac Job System Ultimania, was released on September 6, 2007, as a guide book for the International Zodiac version of the game. On December 18, 2012 the game was re-released as part of the Final Fantasy 25th Anniversary Ultimate Box Japanese package. For the North American release, a "Collector's Edition" was available through GameStop and EB Games. This edition includes the original game packaged in a metallic case along with a special bonus disc, which contains Final Fantasy XII developer interviews, an art gallery, U.S. and Japanese trailers, and a featurette, "History of Final Fantasy", which gives a brief overview of Final Fantasy games. On January 26, 2007, Square Enix Product Blog revealed full-color Gabranth, Ashe, Balthier, and Vaan figures. Final Fantasy XII sold more than 1,764,000 copies in its first week in Japan, almost equaling the sales of Final Fantasy X in its first week. A Square Enix conference report stated that Final Fantasy XII sold more than 2.38 million copies in Japan in the two weeks since its March 16, 2006 release. In North America, Final Fantasy XII shipped approximately 1.5 million copies in its first week. It was the fourth best-selling PlayStation 2 game of 2006 worldwide. As of March 2007, the game had shipped over 5.2 million copies worldwide. By November 2009, over 6 million copies of the game were sold worldwide on PlayStation 2. As of October 2017, The PlayStation 4 remaster shipped over one million copies worldwide. According to review aggregator Metacritic, Final Fantasy XII received "universal acclaim". On March 16, 2006, it became the sixth game to receive a perfect score from the Japanese gaming magazine Famitsu, making it the first Final Fantasy game, first Hiroyuki Ito game, and only PlayStation 2 game to do so. It is also the second Yasumi Matsuno game to garner a perfect score, the first being Vagrant Story. The game was praised for its graphics, scenarios, game system, and the freshness it brought to the Final Fantasy series. It was praised for its seamless transitions between full motion video segments and the in-game engine, and was voted number one for Best Art Style on IGN's weekly Top Ten. Newtype USA named Final Fantasy XII its "Game of the Month" for November 2006, praised the gameplay, graphics, and story, and called it "the best RPG to have been released for any Sony platform". Although GameSpot lauded the gambit and license systems as an innovative and in-depth way for the player to control the characters, it criticized them for being too complicated and difficult to adjust to, especially for newer players of the series. The reviewer also criticized the sometimes tedious back and forth travel. On the other hand, GameSpot took particular note of the "excellent" voice cast. IGN praised the game's rich storyline and artistic direction, shown through its "sheer depth of character". It also assuaged criticism that the gambit system would "let the game play itself", countering that gambits do not function without a player. However, IGN wrote that while "still extremely strong", Final Fantasy XII has one of the series' weaker soundtracks. Executive producer Akitoshi Kawazu was pleased by Famitsu's rating but admitted that he thought the game was not perfect; he felt that the storyline did not meet some fans' expectations. Kawazu expressed his frustration and regrets regarding the storyline, citing creative differences between the PlayOnline and Final Fantasy Tactics members of the development team. Final Fantasy XII was named best PlayStation 2 game and best RPG by numerous video game journals and websites, including GameSpot, GameSpy and IGN. Both Edge and Famitsu awarded it Game of the Year 2006. The Japan Game Awards 2006 honored Final Fantasy XII with their "Grand Award" and "Award for Excellence" and the PlayStation Awards 2006 bestowed the "Double Platinum Prize". It was selected for the list "Top 100 New Japanese Styles", a list of "products and services originating in Japan to serve as a mark of excellence". Final Fantasy XII also received nominations in such categories as best RPG, story, art direction, character design and original musical score at the Interactive Achievement Awards, Game Developers Choice Awards, BAFTA Video Games Awards, Spike Video Game Awards, and the Satellite Awards. An expanded version of the game, Final Fantasy XII International Zodiac Job System, was released in Japan on August 10, 2007. It includes twelve license boards (instead of the original game's one), each corresponding to a different Zodiac sign and job. The player can control guest characters and summons, and hold L1 to double the game's running speed. There is also a "New Game+" option, a "New Game- (minus)" option (in which characters do not gain experience), and a "Trial Mode" in which the player hunts monsters in 100 different maps to gain items and money. The game also includes the western version's English voices and widescreen 16:9 support, and a bonus DVD. A sequel, Final Fantasy XII: Revenant Wings, was released for the Nintendo DS in 2007. It takes place one year after the events of Final Fantasy XII and follows the adventures of Vaan. The game is one of four in the Ivalice Alliance series, which also includes International Zodiac Job System. Fortress, a spin-off action game developed by Grin, was to have been a "game with an epic scale both in story and production values" that took place in Ivalice following the events of Revenant Wings. Square Enix cancelled the project after six months of development. In July 2017, Square Enix released Final Fantasy XII: The Zodiac Age, a high-definition remaster of the Japanese-only International Zodiac Job System for the PlayStation 4. It adds trophy support, a remastered soundtrack with a few new tracks, and improved technical performance. The Zodiac Age was nominated for "Best Remake/Remaster" at IGN's Best of 2017 Awards, and won "Best Remaster" at Game Informer's Best of 2017 Awards and 2017 RPG of the Year Awards. The remaster also received favorable reviews. A version for Windows was released via Steam on February 1, 2018. The port included support for higher display resolutions and 60 frames-per-second rendering, options to switch between three different versions of the soundtrack, and immediate access to the post-game modes. Versions for the Nintendo Switch and Xbox One, ported by Virtuos, are both planned to be released on April 30, 2019. This page is based on the Wikipedia article Final Fantasy XII; it is used under the Creative Commons Attribution-ShareAlike 3.0 Unported License (CC-BY-SA). You may redistribute it, verbatim or modified, providing that you comply with the terms of the CC-BY-SA.